How Does Sound Transit Expand? 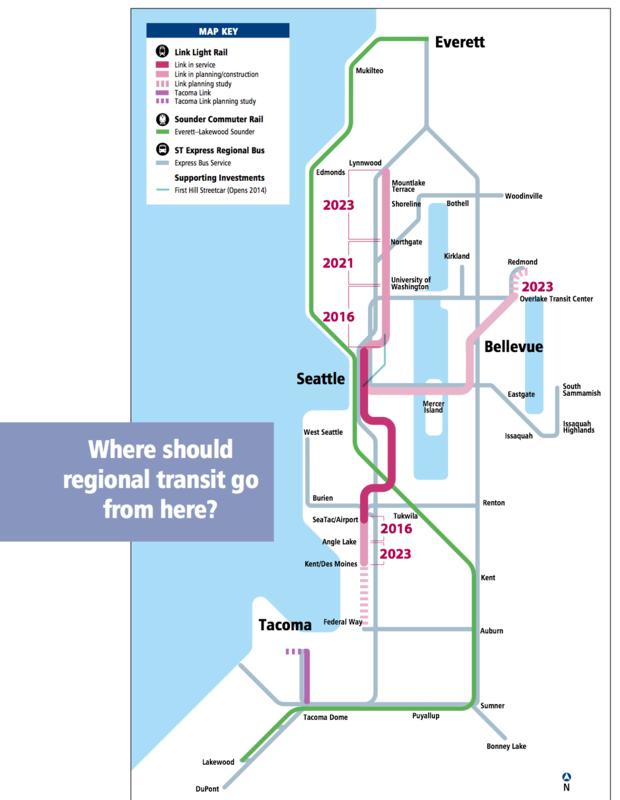 Sound Transit, the regional transit agency that builds Link and Sounder rail services and operates a lot of our express buses, is currently updating their Long Range Plan – a list of projects that informs their future expansion. This is the first phase of any ballot measure for additional Sound Transit service. As someone watching this process closely, this seems like a perfect time to talk about how an idea in an advocate’s head becomes a project serving the public! At a very high level – everything starts with advocacy. To move forward on any project, someone must first convince Sound Transit staff, and eventually the Sound Transit Board, to add that project to the agency’s Long Range Plan – an Environmental Impact Statement (EIS) first finalized in 1993. 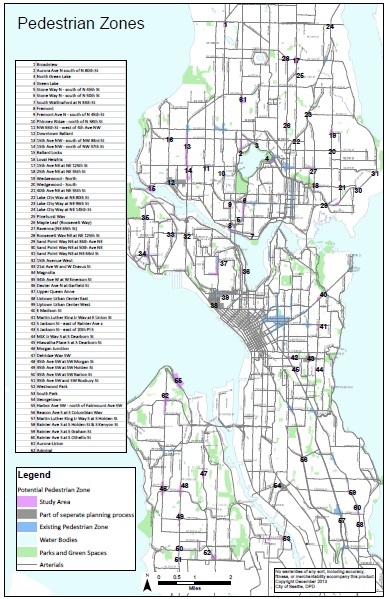 This EIS was updated with a Supplemental EIS (SEIS) in 2005, prior to placing Sound Transit 2 on the ballot, and now, in preparation for a potential Sound Transit 3, it will be updated with a new SEIS. This document is a holistic look at the whole Sound Transit system and how it might expand: those projects that have already opened, those funded or under construction, and those that might be funded someday. The Long Range Plan is financially unconstrained – it isn’t worried about how much funding authority Sound Transit has now, or even how much funding they might win in a future vote. It’s intended to be a menu of projects the agency might build in the foreseeable future, with some, but variable, understanding of their scope and cost, and how those projects would fit into what’s already on the way. The current update started in 2013, and should be complete by the end of this year. There’s a lot of public input gathered throughout, as with any EIS, and at the end, Sound Transit will release a new plan to the public, showing us all the directions we’ve asked them to go. Before that work is even over, Sound Transit must also begin to lobby the legislature for revenue authority – the right to ask voters for more funding. Sound Transit is currently using nearly all of their existing revenue to build projects voters have approved, and will be paying those projects off for many years to come. To build more anytime before the late 2020s, they’ll need the authority to ask voters for more money. Even without the current deadlocked legislature, this is difficult work. Not only does the Sound Transit board have to find a set of projects that are likely to poll well when paired with a particular source of revenue, they have to balance public demand in their own cities and districts with the interests of legislators – and grassroots supporters, major employers, business, labor, and environmental organizations, and engineering and construction firms – all the players who will help bankroll a ballot measure as well as their own elections. The Long Range Plan helps protect Sound Transit from some of these external pressures; by forcing the board to select from a list of somewhat vetted projects, there’s some barrier to terrible projects making it to the ballot. After identifying a revenue source and the bulk of the projects, Sound Transit uses their selections from the LRP ‘menu’ to create a System Plan that they might put to voters. The first System Plan Sound Transit created was put to voters in 1995 and failed, but after modifying the plan, it passed in 1996, first funding Sound Transit projects. This same failure followed by success repeated in 2007 and 2008, with the final vote funding expansion of Sounder service, express bus service, and Link light rail north to Lynnwood, east to Bellevue and Overlake, and south to Federal Way (although with the recession, light rail will only reach Highline Community College for now). A System Plan is financially constrained, including local revenue, bonding plans, and expectations for federal grants, and it includes a timeline. We don’t have time machines yet, so it’s hard to predict what a given source of revenue can achieve as the economy changes, both in how much is collected and in the cost of all the goods and services Sound Transit has to purchase to build a project, but Sound Transit increasingly plans conservatively to mitigate those risks. If Sound Transit is too conservative, the System Plan will be too small or too slow to excite enough voters, and it will fail. If they aren’t conservative enough, though, projects will be visibly delayed and over-budget, dampening public opinion for their future legislative and voter needs. Before going to the voters, Sound Transit’s enabling legislation has one more requirement – they must submit their System Plan to a state expert review panel, adding months to the development of a ballot measure. As far as I understand, the expert review panel has never found a major issue in a System Plan. The import of this process seems to be almost entirely making the state government comfortable with the agency’s decisions – exerting power above and beyond the purse strings of revenue authority, a Dillon Rule artifact. As an aside, if I’m wrong about this, email me! Finally, once the System Plan is approved by the state, Sound Transit puts it to the voters. The board votes to submit a ballot measure to Pierce, King, and Snohomish counties. Sound Transit can’t spend money on campaigns, though, so in the meantime, a campaign is filed with the state’s Public Disclosure Commission, and all the advocates, companies, and organizations I mentioned before put in a lot of money and time to win. As I noted, this has happened four times so far – March 1995 and November 1996, and then November 2007 and November 2008. Different election years dramatically affect voter turnout: some people vote in every election, and tend to be older, whiter, and more well off; a more conservative electorate. The more spent by the campaigns and the more media covering the election, the more younger, more diverse, and more progressive people are reminded (or convinced) to vote. Turnout is far higher in a Presidential election than any other year. Both of these pairs Sound Transit votes consist of a non-mayoral, non-legislative election followed by a Presidential election year. In 1995/1996, Sound Transit chose a conservative year followed by a progressive year – in fact, the original ballot measure in 1995 was a special election, the lowest possible turnout and most conservative electorate they could have chosen. In 2006, Sound Transit was prepared to go to the voters, but the state legislature asked them to wait until 2007 to be paired with highway expansion. In 2008, Sound Transit went to the ballot again by themselves and solidly passed. It’s possible that the highway expansion caused failure of the package (and I would love that to be the case), but I think it can just as easily be explained by the low turnout and more conservative electorate. Far more people voted against Sound Transit when it passed than when it failed. Let me say that again: some 50% more people voted against Sound Transit 2 in the year it passed, 2008, than in the year it failed, 2007 (King 07, King 08, Pierce 07, Pierce 08, Snohomish 07, Snohomish 08). In the year when it passed, though, turnout was dramatically higher – the new ‘yes’ votes overwhelmed the new ‘no’ votes. Suffice it to say, we should be aiming for a Sound Transit 3 vote in 2016. We’ll be writing more about the Long Range Plan update as it continues, as well as particular projects that we can champion. Once Metro is saved, helping Sound Transit win revenue authority will be the next step on the path to Sound Transit 3, and you’ll hear more from us about lobbying existing legislators, as well as electing some new transit friendly faces. Over the past few years, the southern section of Manhattan’s Broadway has steadily transformed from a major vehicle arterial into a “complete street” and pedestrian boulevard. Instead of a “car sewer”, Broadway is now an inviting thoroughfare for walkers and cyclists, and a destination for shoppers, diners, and tourists. In pursuing a policy that discourages automobiles from using the street, traffic planners see themselves as issuing a corrective to history: They say the diagonal of Broadway should never have been allowed to cut a path across the orderly right angles of the Midtown street grid. The resulting three-way intersections can slow down cars and tie up the broader system. Like New York’s Broadway, Madison Street cuts across the grid, creating difficult traffic patterns and an inhospitable environment for pedestrians. When Madison Street was first laid out, it played a vital role in regional connectivity. A cable car ran the length of the street, and ferries waited at the other end to take passengers across Lake Washington. Today, Madison Park is a quiet residential neighborhood, and cars and buses travel across Lake Washington along two wide freeways. In addition, the Pike/Pine corridor has experienced a renaissance, becoming one of the most vibrant (and expensive!) parts of the city. And yet, Madison continues to carry four lanes of fast-moving traffic, cutting through the south end of Capitol Hill in the process. We have a unique opportunity to reshape the southern end of Capitol Hill. By changing the role and layout of Madison Street, we can create a better environment for pedestrians, cyclists, and transit users. And we can do this while simultaneously improving mobility for drivers (or at least not harming it). 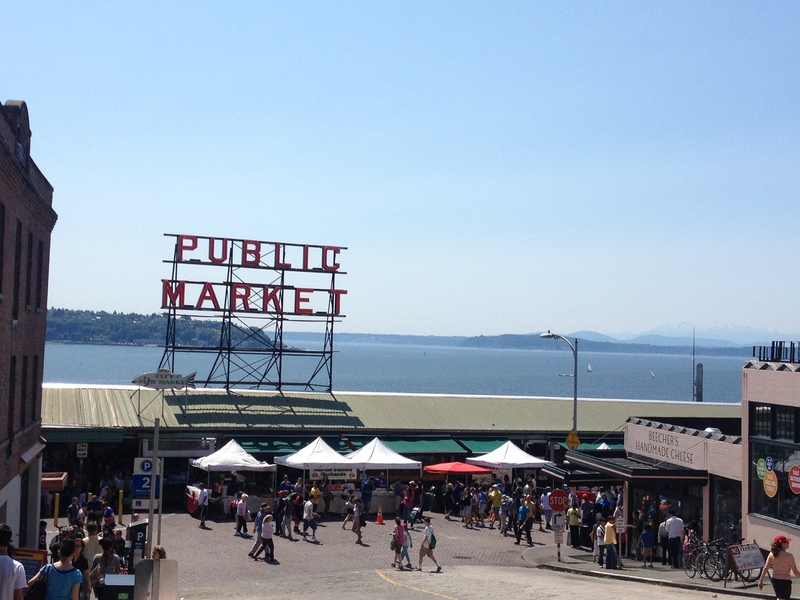 Great cities have active pedestrian-oriented retail areas, and Seattle has many. Could we use more? I think so, and Seattle Department of Planning and Development (DPD) does, too. DPD is evaluating a major expansion of the city’s Pedestrian Retail Area zones, the biggest such expansion in the city’s history. The Pedestrian Retail Area designation is an overlay on top of an area with Neighborhood Commercial (NC) zoning. The designation doesn’t increase development capacity. Instead, it requires pedestrian-oriented businesses on the ground floor, restricts driveway placement and parking, and waives parking requirements for certain uses. The rules are designed to foster a variety of uses and make these areas more walkable and safer for pedestrians. DPD is considering a set of new rules to strengthen Pedestrian Retail Areas by requiring that developments provide wider sidewalks and overhead weather protection, setting minimum floor area ratios (in Urban Centers, Urban Villages, and Link Light Rail station districts), and limiting lanes for businesses. DPD has identified 62 study areas for the project, including some new areas and expansions of exiting ones. For each study area, DPD has prepared an informational overview to analyse study area conditions, potential regulatory change impacts, and the study area candidate rating. Many new mixed-used developments have been proposed, such as the recent project Aurora 77 at the intersection of Aurora Ave N and N 77th St. If any area of Aurora has a real chance as a pedestrian-oriented street, this is it. Designating this corridor as a Pedestrian Retail Area will build upon the recent success of the area, reconnect both sides of Aurora, and further tame the street. DPD is seeking input from the public on the study areas. If you’re interested in making Seattle more pedestrian-friendly, please take their online survey. It will only take a few minutes. The survey concludes on March 31, 2014. Read more stories form the road at www.nathanvass.com. It’s that kid again, the one with the observant eyes. I’ve had a chance or two to chat with him in the interim. He is Amad, eleven or twelve, dressed in ordinary, low-profile garb. No flashy bling or starched denim–just a regular dark gray hoodie, not baggy, and jeans that fit. Amad’s coming home from school–it’s late afternoon on the 4, several hours after the schools have let out. Absent-mindedly I wonder what he was doing hanging around for so long before going home. “Hope it was a good day at school,” I say. I like to engage the young folk, to give them the example that yes, strangers can and do talk to each other. As a youngster, such opportunities can be strangely absent, particularly if you’re not employed; you may spend years of childhood and adolescence talking only to peers and adults in environments you already know. This past week saw a new plot twist in the Bertha tragicomedy: vehicle traffic is way down on the Alaskan Way Viaduct, from 110,000 daily trips in 2009 to 62,000 in 2012. As Ben noted, this not only explains some of the drop in solo commuting Mayor Murray touted in his State of the City speech but also bolsters the Mayor’s goal of lowering it below 25 percent. In fact, this target almost certainly hinges on not finishing the tunnel, since that new capacity would shift recent converts to carpooling, transit, and cycling back into their cars. Given the uncertainty that Bertha will ever complete her route, there’s no question the SDOT data is good news. If we enter into the legal and engineering quagmire that the current standstill portends and the tunnel never comes to be, at least we’ll avoid catastrophic citywide gridlock. 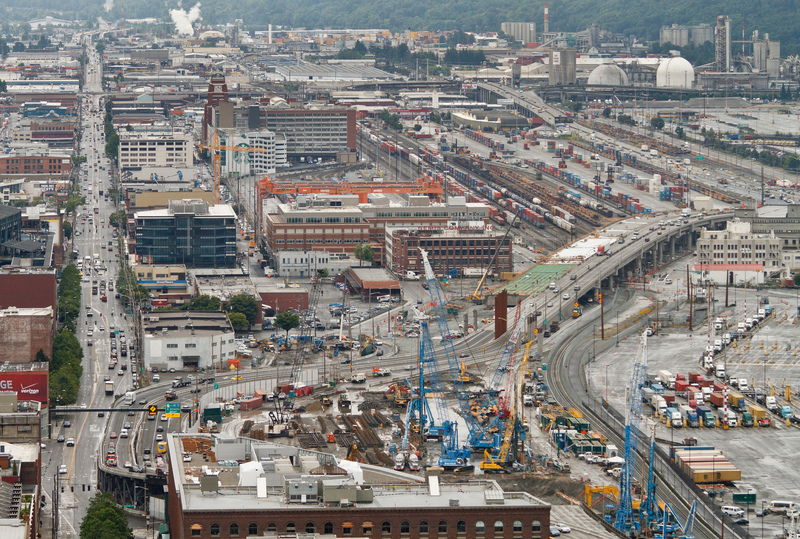 Over at Sightline, Clark Williams-Derry offers four reasons that Viaduct volumes have declined. The most interesting is the “disappearance” of trips due to traffic delays, as commuters have shifted modes and changed routes in response to congestion caused by the removal of the southern end of the Viaduct. But not all of Seattle has seamlessly adapted to the substantial drop in capacity. Though a little hyperbolic, the commenters on Clark’s post reveal that commuting from West Seattle remains a struggle. But the tunnel has never been the best solution to that. Not only is it devoid of exits into downtown and liable to worsen, not improve, congestion in Pioneer Square, but it’s stuck in an outdated, cheap-oil paradigm that we need to move away from. Plus, we now see it’s grossly overbuilt! It was sized for and justified based upon 110,000 daily trips, 40 percent of which are gone. Still, I fear discounting the grievances of West Seattle commuters only solidifies their pro-tunnel point of view. In their minds, after all, they haven’t adapted seamlessly to a diminished Viaduct. Plus, it detracts from the real solution: bringing light rail to West Seattle. That isn’t a new fight. Back in December David Lawson considered what a West Seattle Link might actually look like. Two months on, the data prove we don’t need the tunnel. But if commuting from West Seattle is really a nightmare, then the case for connecting it with better transit is only stronger. Rather than deflect their plight, let’s redirect disgruntled commuters towards that goal. Next City’s article “Five Extreme Models to Combat High Rent” is an interesting read simply because it lays out solutions to housing price problems that have actually been put into practice. It also illustrates (intentionally or not) why some of those methods aren’t actually solutions. But one city has made it work: The tiny principality of Monaco. There isn’t much room left for building in the less-than-one-square-mile city-state on the French Riviera, but when a new development comes around it includes — or at least funds — a lot of affordable housing. anyone without obscene wealth or the good fortune to be born there would be shut out of the city. This example illustrates how easy it is to confuse the goals of providing a certain number of affordable units with the goal of having an affordable city. Just because a city has affordable units, doesn’t mean the city is affordable; if a city is truly affordable, anyone with a reasonable amount of income should be able to move there. The same issue is seen when the author talks about rent control in Stockholm. The prices of apartments are affordable, but it can be almost impossible to actually get an apartment. The city has a wait list for apartments because there isn’t enough housing. Statistics from Stockholm’s municipal housing queue show average wait times of 8.5 years (up to 17 years in the central city). There is no point in having low rent if you can’t actually get an apartment. Neither inclusionary zoning nor rent control in these two case studies offer actual solutions. The article does show three examples of cities that have managed to keep the price of housing low while also providing accessibility. Two of the cities, Houston and Tokyo, basically allow developers to build as much housing as they like. In Singapore, the third city, nearly all the housing is built and provided by the government. The key characteristic to note with all these examples is that enough housing is built. The downside of ubiquitous public housing, though, is that it looks like public housing. HDB flats aren’t as bad as the towers-in-the-park that went up in U.S. cities after World War II, but they’re not a whole lot better. That may be a downside of housing in Singapore, but we should applaud the city for actually putting accessible housing above aesthetics. Furthermore, if the housing is publicly owned, it seems likely that people could encourage the government to build more diverse and attractive housing. The author offers a similar critique for Houston: Unregulated development has created an ugly city. It’s inaccurate to describe Houston as completely unregulated. The city does a number of things to regulate how land can be used, including design review. 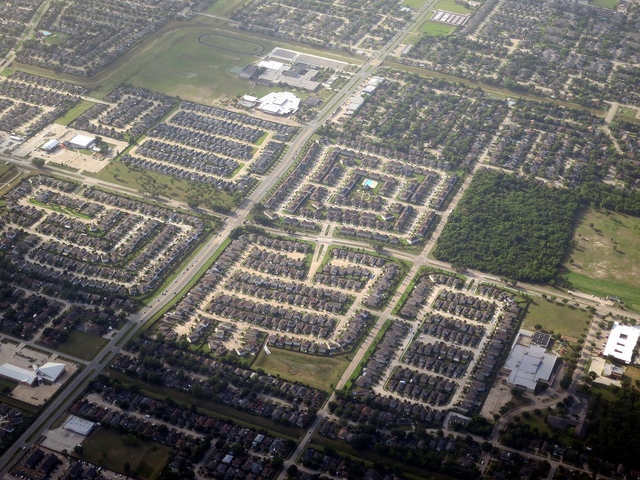 Since I’ve been to Houston, I would concur that it’s sprawl and highways are ugly. Again, this is a small complaint compared to accessible housing. It also misses a more important complaint about the Houston model. The price that people pay for rent is not the only price paid for housing. It is nearly impossible (and dangerous) to live in Houston without a car and car ownership is expensive! According to a Consumer Reports study, the absolute lowest paid per year for a car was $5,000. If average rent in Houston is $881 per month (as this article claims), owning the cheapest car possible could make rent over 50% more expensive. Lastly, the author discusses Tokyo. Supposedly Tokyo is unique in that it doesn’t zone for density. Tokyo is a fascinating example because it is a huge city that has managed to actually have much more affordable housing than other cities. 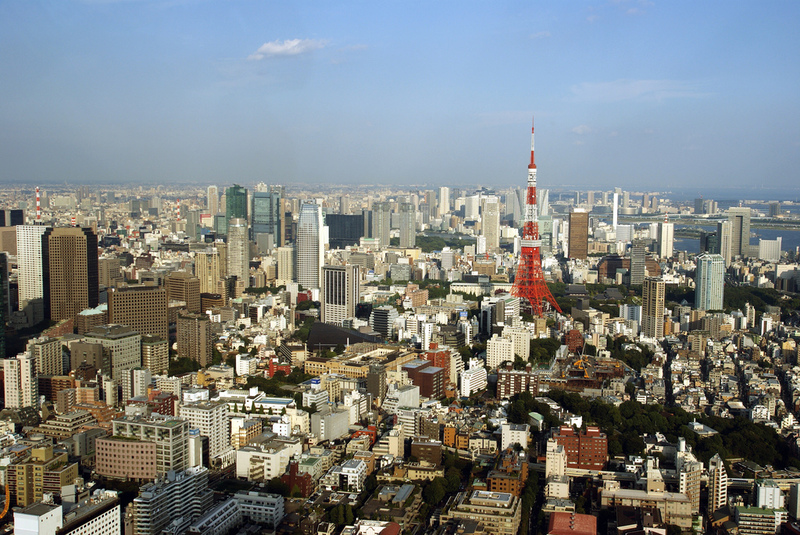 In fact, buying a home in Tokyo is similarly affordable to Sacramento or Providence Rhode Island (page 16). The author’s complaint with Tokyo is interesting. While the city is known for its public transit, the author posits that Tokyo has extremely long commutes, citing a blog post as proof. Take note that this citation is a blog post from 2008 by a random person on the internet, who himself is only making a rough estimate. If people live densely and housing is affordable, why wouldn’t people move closer to where they work? I remain skeptical that Tokyo has much worse commute times than other cities, but if that is true, it is a real concern and should be considered in an evaluation of housing cost. Like we’ve said before, when we talk about housing cost, what we’re really talking about is accessibility to housing. Housing is accessible when you can answer “yes” to this question, “Can you move where you want?” A city in which you have to wait eight or more years to get an apartment has not solved the housing price problem. Lastly, housing is intimately tied with other costs that need to be taken into consideration beyond the listed price of rent. Seattle has a real opportunity to offer a unique solution to the housing cost problem. In both Houston and Japan, additional costs like transportation may add significantly to the affordability of housing. In both of these cities it appears that some smart planning and a focus on density could be a solution. Seattle is unique because the city actually encourages density and the state of Washington attempts to restrict sprawl. The only thing missing from our housing accessibility is a serious attempt to building more a lot housing. Your Housing Is More Expensive If You Have To Own A Car. Here’s How Much. One of the biggest pleasures I get out of living in a city is that I don’t have to own a car. Cars can be a great convenience and a lot of people enjoy driving, but I’ve never been one of those people. I’ve always found driving stressful. Nevertheless, the conveniences of owning a car are huge. I still rent a car about once a month, carry memberships for car2go and Zipcar, and occasionally use taxis. With that said, my day to day life is possible without owning a car and I feel extremely fortunate to have this choice. This is entirely due to the way Seattle is designed but, unfortunately, not everyone can choose to get rid of their car. Freedom to get from point A to point B is incredibly powerful, but providing more transit options is more empowering than simply giving people transportation choices. 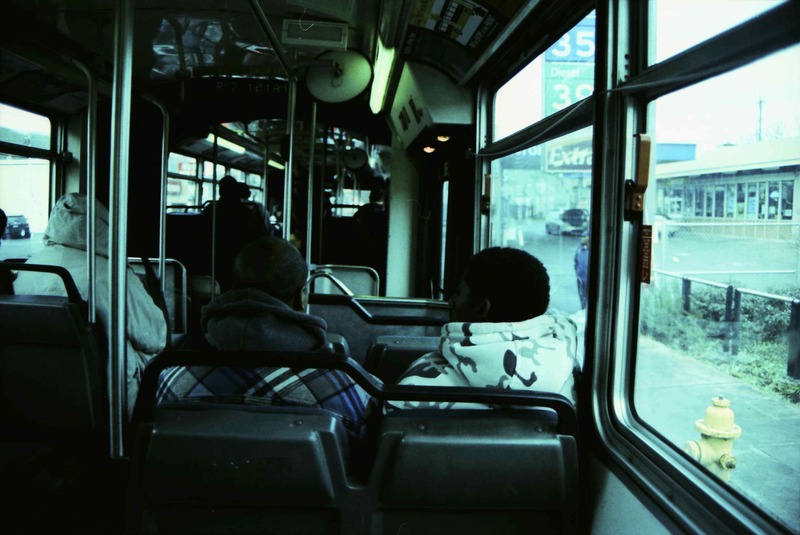 In fact, the most empowering aspect of transit is that it saves people a lot of money. I initially got rid of my car because I couldn’t afford it. The extra money was huge for me. 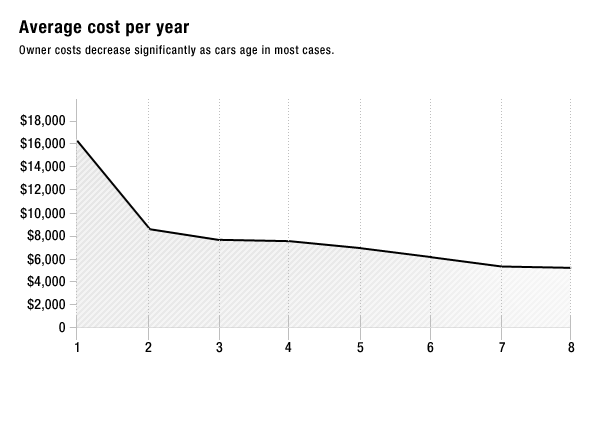 In case you were wondering, here’s the cost of car ownership per year (from Consumer Reports), graphed against how long the car is owned. Yesterday, in Mayor Murray’s first state of the city speech, he touts downtown’s low single occupancy mode share (page 10) – fewer than half of downtown commuters drive alone to work, preferring instead transit, walking, biking, or carpooling. He laid out a vision I strongly agree with – reducing driving alone from just under 50% to 25%. This morning on Sightline Daily, Clark Williams-Derry shows us why we’ve dipped below that 50% mark – “traffic volumes on the Alaskan Way Viaduct have collapsed“. The viaduct is down from carrying 110,000 cars a day – the number used to justify needing a tunnel – to only 62,000. Surface streets are seeing a barely noticeable increase. Transit usage has jumped. This lack of gridlock was predicted by myself and other proponents of the cheaper, lower carbon emissions, more equitable, lower risk, and faster surface/transit option. Great, right? Not so fast. Finishing the tunnel would likely bring driving alone back above half of commute share. Currently, car trips bypassing downtown on I-5 compete with commute traffic. Putting them in the new tunnel would free up car space on I-5 and other routes, shifting users back from transit to driving, and taking our goal backwards. If we agree with Mayor Murray’s goal, we would be better off stopping the tunnel today, and spend the remaining money on projects that grow the transportation system we want.